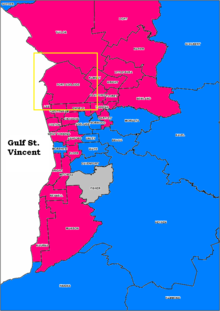 Port Adelaide, outlined in yellow, is a north-western metropolitan seat in Adelaide, South Australia. A by-election occurred in the South Australian House of Assembly seat of Port Adelaide on 11 February 2012. Labor's Susan Close won the seat on a 52.9 percent two-candidate-preferred (TCP) vote. The by-election was triggered by the resignation of former Deputy Premier, Treasurer and state Labor MHA Kevin Foley. Foley and Mike Rann resigned from their parliamentary seats, which created twin by-elections for 11 February, the other being the 2012 Ramsay by-election. On two-party-preferred vote (TPP) margins of 12.8 and 18.0 points from the 2010 election, considered safe margins on the current pendulum, Labor would have likely retained both seats on the TPP vote based on unchanged statewide Newspoll since the previous election. In the lower house, 24 seats form a majority, the Labor government held 26 of 47 seats. If one or both seats had been lost, Labor would still have retained majority government. Foley was first elected as the member for the new north-western metropolitan seat of Hart at the 1993 election. Hart was mostly replaced with a recreated Port Adelaide ahead of the 2002 election, and Foley followed most of his constituents into the new seat. From Rann Labor's election to government in 2002 until 2011, Foley became the longest-serving Deputy Premier of South Australia and the third-longest-serving Treasurer of South Australia. The last by-election was the 2009 Frome by-election, when another former Premier, Rob Kerin, retired from politics. The seat was narrowly won by an independent candidate. 12 December 2011 Kevin Foley resigned from the Parliament of South Australia. 4 January 2012 Writs were issued by the Speaker of the House of Assembly to proceed with a by-election. 16 January 2012 Enrolment on electoral rolls closed, with a total of 25,248 voters enrolled for the by-election. 19 January 2012 Candidate nominations closed and ballot order draw occurred, in line with s60(a) of the Electoral Act 1985. 11 February 2012 Polling day occurred between the hours of 8am and 6pm. 27 February 2012 Writ returned before this date for formal result declaration. Independent True Blue Voice Sue Lawrie Liberal Party member, contested seat at previous election as the official Liberal Party candidate. Independent Ban Live Animal Exports Colin Thomas Contested the federal Port Adelaide seat for the Greens in 2007 and the neighbouring state seat in 2010 as an independent. Independent Communist Australia Bob Briton Endorsed candidate of the unregistered Communist Party, who contested the neighbouring seat at previous election. Democratic Labor Elizabeth Pistor No information available. One Nation Grant Carlin Runs a horticultural business. Labor Susan Close Former Department for Environment and Natural Resources executive. SA Greens Justin McArthur Student, environment officer and union board director at Adelaide University, and a radio producer. Independent for You Gary Johanson Former Liberal Party member, and Mayor of Port Adelaide Enfield. Liberal Democrats Stephen Humble Studied electronic engineering at TAFE, communications engineer for a large corporation. A record nine candidates nominated for the seat of Port Adelaide. The Liberal Party, Family First Party, and independent candidate Max James, who contested the previous election and gained a primary vote of 26.8 percent, 5.9 percent, and 11.0 percent respectively, did not contest the by-election. On 21 September 2011, 642 voters were polled in the seat. Before either major party decided on a candidate, Labor's primary vote was at 37 percent (49.9 percent at the last election), the Liberals on 31 percent (26.8 percent), Johanson on 14 percent, the Greens on 11 percent (6.3 percent), and other independents with 6 percent. On 18 January 2012, 475 voters were polled in the seat. Since the September 2011 poll, there had been a change of Premier, Labor preselected Close, Foley formally resigned from parliament, and the Liberal Party declined to field a candidate. Labor's primary vote was at 48 percent, Johanson on 23 percent, the LDP on 14 percent, Lawrie on 9 percent, the Greens on 3 percent, with remaining candidates on about 3 percent collectively. On 1 February 2012, 402 voters were polled in the seat, with Labor on 44 percent, Lawrie on 18 percent, Johanson on 14 percent, the Greens on 12 percent, and remaining candidates including the LDP on about 12 percent collectively. Under instant runoff voting with voters' full preference allocation, on the above polling and without a Liberal candidate, it was possible for one of several candidates to win. On how-to-vote cards located on all polling booths at each polling place, Briton recommended preferences to the Greens and then Labor, the Greens recommended preferences to Labor, Thomas had a split ticket recommending Labor or Johanson, while the remaining party and independent candidates including Johanson generally recommended preferences between each other in varying order. The by-election was expected to be a close contest on both eliminated candidate preference flows and the final TCP vote. Labor retained the seat on a 52.9 percent TCP vote against Johanson, with a majority in seven of 11 polling places. Postal votes were included on 13 February, absentee and pre-poll votes were included on 14 February. Preference distributions occurred on 18 February. Results are final. Neither a TPP or TCP swing could be produced, as the 2010 result was between Labor and Liberal rather than Labor and independent with no Liberal candidate. An increase or decrease in margins in these situations cannot be meaningfully interpreted as swings. As explained by the ABC's Antony Green, when a major party does not contest a by-election, preferences from independents or minor parties that would normally flow to both major parties does not take place, causing asymmetric preference flows. Examples of this are the 2008 Mayo and 2002 Cunningham federal by-elections, with seats returning to TPP form at the next election. This contradicted News Ltd claims of large swings and a potential Liberal Party win in Port Adelaide at the next election. At the 2014 election, Port Adelaide was Labor's 7th safest seat on a margin of over 10 percent. Johanson unsuccessfully contested the neighbouring seat of Lee at the 2014 election with a primary vote of 11.2 percent. ^ a b Martin, Sarah (13 December 2011). "Date set for Port Adelaide by-election after Kevin Foley resigns". AdelaideNow. Retrieved 28 January 2011. ^ a b Wills, Daniel (6 November 2011). "Labor by-elections candidates confirmed". The Advertiser. Retrieved 28 January 2012. ^ a b c Kelton, Greg (23 September 2011). "Polling shows Labor will hold Foley seat in a by-election". AdelaideNow. Retrieved 28 January 2012. ^ Wills, Daniel (18 November 2011). "Labor soars on crest of a Jay curve". The Advertiser. Retrieved 28 January 2012. ^ "Port Adelaide by-election candidates announced" (PDF). Archived from the original (PDF) on 24 April 2013. Retrieved 26 July 2012. ^ Electoral Commission SA. "Port Adelaide election timetable". Archived from the original on 9 April 2013. Retrieved 28 January 2012. ^ a b c d e f g h i j k l Green, Antony. "2012 Port Adelaide by-election guide". ABC Elections. Retrieved 28 January 2012. ^ "Liberal independent to contest by-election". ABC Online. 21 December 2011. Retrieved 28 January 2012. ^ "Bob Briton to run in Port Adelaide by-election". Cpasa.blogspot.com. 2011-12-15. Retrieved 2012-07-26. ^ "Communist Party to contest by-election". The Advertiser. 15 December 2011. Retrieved 28 January 2012. ^ "One Nation website". Sa.onenation.com.au. Archived from the original on 18 February 2011. Retrieved 26 July 2012. ^ "Port mayor looks to run against Foley". ABC Online. 23 February 2010. Retrieved 28 January 2012. ^ "Stephen Humble Facebook profile". Facebook.com. 2010-01-31. Retrieved 2012-07-26. ^ "Libs yet to decide on SA by-elections". NineMSN. 7 November 2011. Archived from the original on 14 July 2012. Retrieved 28 January 2012. ^ Wills, Daniel (20 January 2012). "Female voters save Labor's seat". The Advertiser. Retrieved 28 January 2012. ^ "Port Adelaide poll fear for Labor". Adelaidenow.com.au. 2012-02-03. Retrieved 2012-07-26. ^ Crouch, Brad (2012-02-04). "The battle for Port heats up". Adelaidenow.com.au. Retrieved 2012-07-26. ^ Williamson, Brett (2012-02-06). "Port Adelaide by-election may bring surprise result". Abc.net.au. Retrieved 2012-07-26. ^ "2012 Port Adelaide by-election results". Ecsa.sa.gov.au. 18 February 2012. Archived from the original on 28 July 2012. Retrieved 26 July 2012. ^ "Port Adelaide by-election preference distribution" (PDF). Archived from the original (PDF) on 9 April 2013. Retrieved 26 July 2012. ^ "2012 Port Adelaide by-election results: Antony Green ABC". Abc.net.au. 2012-02-20. Retrieved 2012-07-26. ^ "Port Adelaide and Ramsay by-elections live: Poll Bludger". Blogs.crikey.com.au. 2012-02-11. Retrieved 2012-07-26. ^ "A Comment on the Size of the Port Adelaide Swing, Antony Green". Blogs.abc.net.au. 2012-02-13. Retrieved 2012-07-26. ^ Editor, State (2012-03-02). "Port now a poll target for Liberals". Adelaidenow.com.au. Retrieved 2012-07-26. This page was last edited on 12 February 2019, at 09:52 (UTC).